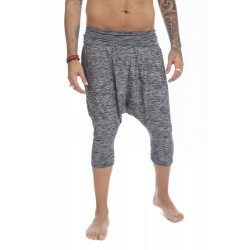 You can use them in any situation, during your yoga practice or for a casual street look. They combine perfectly with any tops from our men’s section. Featuring elastic waist, pockets on each side and ribs in the ankles, they will undoubtedly be one of your favorite yoga pants. Once you wear them on, you will not be able to take them off! Available in ecru, black and stone grey.